Boiler Pressure Problem - Do I need a repair or can I fix it myself? By far the most frequently encountered problems on modern sealed system boilers are pressure related. The solution is not always as straight forward as many would think, so here's my professional advice on the subject - if you can stomach the technical bits. All pressurised boiler systems need a certain amount of pressure to work, about 0.5 - 1 bar, but some will continue to work with far less. There will a pressure dial either on your boiler, underneath it or near the hot water cylinder that indicates the current pressure. Sometimes the gauge dial has both a red and a black needle. so the correct pressure can be set by matching the black to the red needle. Maintaining the system pressure once a year is usually a fairly easy operation by adding water through the filling loop. In most cases the filling loop is a silver braided flexible metal tube with a shutoff key on either side. Do this only when the system has cooled down and remember to shut both keys again afterwards. Note that in the picture the valves are in the open position. Closed will always be "cross ways" to the flow. On some combi boilers the filling loop is internal to the boiler and located somewhere directly underneath. Some are more obvious than others, so if you can't find yours you will need to look in the user manual or Google it. If you have to re-pressure your boiler frequently or if you see the needle climbing to 3 bar when the central heating is on, there is a problem that needs addressing. Logic might dictate that there is a leak on your system if it pressure drops down to 0 bar often, but this is not always the case. Frequently it's because there is no air in the expansion vessel and this causes the system to over-pressurise and expel central heating fluid to the outside via a safety valve. Let me explain. Heat causes liquid to expand and in a pressurized system this will become dangerous if left unchecked. So all sealed systems have a built in expansion vessel (E.V) to counteract pressure & a safety valve (PRV) that will automatically release the excess pressure once it goes beyond the 3 bar mark. The expansion vessel's internal neoprene bladder must be inflated for it to function correctly, and the level of air needs to be maintained through annual servicing or eventually it will dissipate completely. So if the E.V inflatable diaphragm is not inflated, the pressure will slowly rise unchecked beyond 3 bar and then fall back a bit when released via the PRV. This rise - fall will keep happening again and again until finally there is insufficient pressure left in your system for the boiler to function. To fix this call your local gas heating engineer and ask him to re-inflate the expansion vessel which is either built into the boiler but could be located externally too. To do this all pressure has to be drained off first and then using a pump the vessel is inflated through a valve exactly the same as you find on car tyres. The air pressure inside a boiler vessel should be around 0.8 bar but this could be higher for external EVs. Your gas heating engineer will also check that the air inlet valve is not leaking and afterwards set the overall pressure correctly. On the odd occasion this will unfortunately not solve your boiler misery and you will need a boiler repair. If the internal bladder that holds the air is punctured or perished then the air will simply dissipate again. If you press the air inlet valve down and water comes out instead of air that's a sure sign that it's a goner. But a lot of times it's not that obvious because there is a pinhole puncture and it leaks out over days or even weeks. So after your vessel has been re-inflated keep an eye on the gauge to see if it holds correctly for the next few weeks. If this diaphragm is gone you will need to replace the entire EV unit. Once again, not all boilers are created the same. With some it's a straightforward operation for your Gas Safe engineer, but with some older models the vessel is "trapped" behind the boiler and cannot be removed without taking the entire boiler off the wall. In this case it will probably be far more economical to either install an external EV or consider replacing it with a new boiler of better design. Secondary problems that stem from boilers either over-pressurising or not having sufficient pressure. You might also have cold radiators upstairs as result of low pressure. If the boiler is located downstairs the pressure might not be sufficient to push the hot water through the central heating to the top of the property. Always bleed the top floor radiators after adding more pressure otherwise that air might remain in the system preventing your radiators from heating. Bleeding the air from the radiators will then drop the pressure lower again, so check it again afterwards and adjust it accordingly. When the PRV safety release valve is activated some internal debris might stop it from properly shutting off again. The boiler will lose pressure very frequently and you can easily spot this from the dripping at the end of the external outlet. In this case the PRV will have to be taken apart and cleaned or otherwise completely replaced. The boiler's Automatic Air Release (AAV) will start weeping when it's constantly over-pressurised. If you solve the main pressure problem causing this it will most likely stop leaking, but sometimes the AAV will also need replacing. If your boiler has been over-pressurising for a long time and you have been constantly topping it up from the filling loop, it will have depleted the chemicals inside the central heating system. It's very important to add more chemicals, or the entire system will start to corrode and destroy your boiler in no time at all. On rare occasions a high pressure problem could be the cause of the filling loop letting water through. 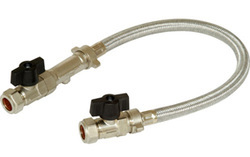 A filling loop effectively connects your mains water supply directly to your central heating, so if the valves don't shut properly even a slight drip through can raise the pressure to 3 bar or beyond. Or sometimes the valves could have been opened accidentally. Make sure they are in the closed position. Hot water pressure is governed by mains or supply water pressure and the flow through your boiler and pipework. Scale is normally to blame if this is a problem. However, if the boiler "locks out" because of a central heating pressure problem then the hot water will also no longer function.